This is my first attempt at directing an 18th century comedy, and I must confess that I approached the task with some trepidation. The only thing I was sure of was that I wanted to complement the parallel production of “Our Country’s Good” and, above all, to create an enjoyable evening at the theatre. To take the heat off myself to some extent I decided what I did NOT want to do with the play: I did not want to reconstruct an 18th century performance – that would be far too difficult, and there are different opinions as to exactly what an 18th century (and which part of it?) performance would really have been like: I wasn’t there, so I have no first hand knowledge to go upon! In any case, the audience would not be an 18th century one so there was a danger that any attempt at a reconstruction might be seen as “very interesting” rather than as an enjoyable evening at the theatre. I also decided I wanted to avoid “Restoration Camp”: the costumes and mannerisms must not be allowed to reduce the play to the level of a caricature. But I also decided to let one character, Captain Brazen, go as far as possible in that direction, without stepping completely out of line with the other characterisations. One result of this is that I have left the introduction of florid bows and curtsies until the last stage of rehearsal, so that they would not get in the way of developing convincing characterisations. Farquhar’s plays are sometimes classified as “Restoration Comedies” even though Farquhar was not even born when Charles II came to the throne. Farquhar lived in the echo of the Restoration rather than in the white heat of it that produced the biting satire, formalism and acerbic wit of the true Restoration Comedies. “The Recruiting Officer” really occupies an interesting position in the transition between true Restoration Comedy and the much more sensitive and realistic comedies which became the fashion later in the 18th century. So, I thought, we could go for the satire while keeping our characterisations fairly realistic. Sounds pretty modern really! What I think (hope) has emerged from these considerations is a play that is funny in the same way that a modern play might be funny – the characters and the predicaments in which they find or place themselves are quite recognisable to a modern audience, even if they do not understand the laws concerning recruiting in 1704; the gender role-reversals brought about by Melinda and Silvia’s sudden elevation to the ranks of the very rich raise all sorts of issues with which a modern audience will be very familiar from feminist discourse; the open attitude to sexuality and to relationships is refreshingly modern compared with the Victorian hypocrisy which fills so much of the period drama we see on TV and on stage. So I stopped being frightened and decided that if what I saw in rehearsals made me (and the cast and production team) laugh, it would probably provide an enjoyable evening in the theatre! So comprehension and enjoyment have come ahead of authenticity in my priorities: I have judiciously edited the text (often along the lines of the Royal Court production) and altered some words and a couple of phrases that simply blocked comprehension for a modern, non-specialist audience: I have also replaced a few of Farquhar’s topical jokes with jokes that will be topical to an audience in November 2000. My major modification is to precede Farquhar’s play with a brief series of tableaux representing the “recent and most victorious Battle of Blenheim”. I use this not only to establish the importance of the Battle of Blenheim in the public imagination in 1704 (and much later in the 18th century – it was the contemporary equivalent of the Falklands Campaign) but to establish the dual meaning of “recruiting” which runs through the play – I will refrain from explaining this more for fear spoiling the opening of the performance! My directorial method (grand phrase) is to have a clear idea of where I want to end up but to let the actors show me the possibilities they can offer me along the way. One implication of this (as well as of the very short rehearsal period) is that I asked the actors to come to all rehearsals very familiar, at least, with their lines. Much to my admiration and relief, they have complied admirably with this request: this has confirmed my hunch that “we need to know the moves before we can really learn the lines” is nothing more than an excuse for not getting on with it – one I have often used myself when acting! The aim (almost fully achieved) has been to run scenes without books at the end of the rehearsal. When we approach a scene for the first time, we discuss basic characterisation and I ask the actors to “show me” – having been given the basic layout of the set and furniture (very little), and deploying their common sense and whatever experience they have (in some cases very considerable, in others, none at all) they hack through the scene, blocking it for themselves and finding whatever comedy potential and emotional dynamic they can. From that starting point I add my own thoughts, we refine motivation and characterisation, and we gradually re-block (usually) and reshape the action and emotion of the scene. It’s an organic process and like all natural growth has to be sensitively stewarded rather than prescriptively directed. So far the results have been very satisfactory. But before the cast protest at this perhaps somewhat idealised account of what we get up to at rehearsals, I will confess that the shortness of time available has lead me a times to be more prescriptive up front than I would ideally choose, just to get the job done! Farquhar’s play is about gently debunking national heroes, showing them as vulnerable and not entirely honourable human beings (it was to Blenheim a soft version of what “Tumbledown” was to the Falklands War); and it is about what happens when women gain certain attributes (money in Melinda’s case, man’s clothing in Silvia’s case) that enable them to behave (almost) as men. 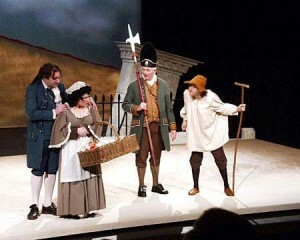 The play is also a gentle and affectionate satire of provincial life. Farquhar had first hand knowledge of the army and of recruiting: as well as being a playwright he was for while a Grenadier Guard officer and he actually did spend time recruiting in Shrewsbury – it was during this period of his life that he wrote “The Recruiting Officer”. So what we see in the play is an exaggerated, comedic account of events and people Farquhar experienced for himself.